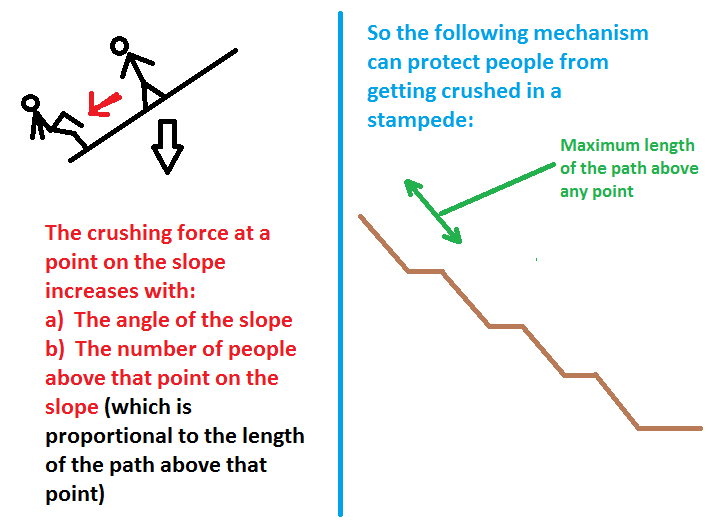 We made an assumption in my previous post on a technique for preventing stampedes … that the force that can result from a crowd of people falling increases with the slope and with the number of people up above that point. If this assumption is valid, there are simple techniques for preventing deaths from stampedes. One of the simplest techniques, (courtesy of Saravanan – Microsoft Research in Bangalore), is a path designed as shown in the above image. There are horizontal sections to the path at regular intervals. These sections ensure that the weight of people falling on anyone would be limited to the length of the path between two horizontal sections. It’s a simple mechanism to prevent death from crushing during stampedes on sloping ground. It turns out that the stampede at the Ganga last week happened on flat ground. People seem to have died from being trampled over rather than from the pressure of a mass of people falling or leaning together. Well, I can’t think of a fool-proof solution for being trampled just yet, but I believe that some day someone will find a way. What is interesting is that so many problems have solutions, but people need to care enough about each other to act on them. Thinking up solutions is one thing. Developing a society where people care is quite another. Social responsibility and I am ranting!